For casual collectors and players. Record every card you own - even foils! Find out how much your collection is worth. Historical graphs show your collection value over time. Find the best cash offer for any card. 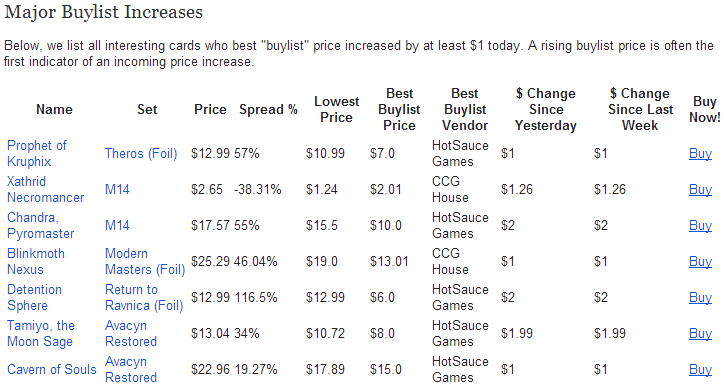 See daily and weekly price changes for every card you own. Powerful filtering and sorting tools to manage large collections. Wishlist tool tracks the cards you want to own. Export your entire collection to excel or CSV file (or import it). FREE weekly email covers the biggest MTG finance news stories. For those who spend $25/month or more on magic. Daily, hyper-detailed email alerts on cards that are moving. Historical "in stock" inventory graphs and buylist prices to help you PREDICT price movements. Specialized emails for Modern, Legacy and Foil cards. Best Deals tool - find the very best deals a store is offering. Arbitrage opportunity list - buy from one store, sell to another, make "free money." MoneyBoard tool shows an entire set from every vendor's perspective, all on one screen. Private ProTrader forums - heavily moderated to ensure only high quality posts. Just $4.99 a month or $49.99 (save almost 20%) a year. © 2016 Quantitative Methods, Inc. All Magic: the Gathering images and descriptions © Hasboro. The ProTrader Briefing is a daily email containing a snapshot of the last 24 hours of market activity and fresh updates of our advanced MTG metrics. 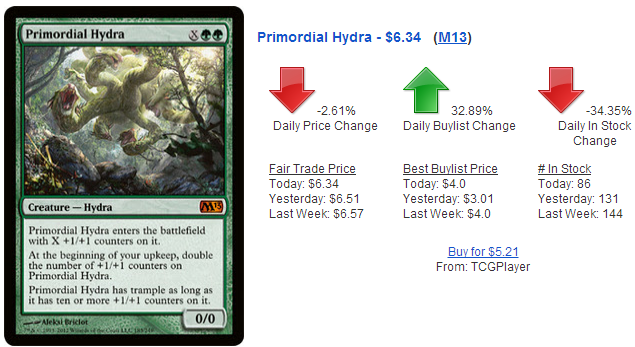 The first section "Most Interesting Cards", shows the MTGPrice.com top picks for the next day of trading. Clear metrics spell out exactly why the ProTrader system chose each pick. As a ProTrader, you will have access to the raw inventory data of major stores. One powerful use of this data is to detect major swings in inventory before the market reacts. A drop in the supply of a card of over 25% in a day is often an indicator of a pending price increase. The "Buylist Price" is the amount of CASH a vendor will give you in exchange for a card. An increase in the highest buylist price available usually means that a card is in higher demand and often precludes a jump in the selling price of a card. Major buylist changes are included in your Daily Briefing. The Gains and Losses section of the Daily Briefing highlights notable price changes. To avoid overloading you with information, we only show changes over 10% on cards over $2 that had at least twelve in-stock yesterday. The concept of arbitrage is simple - buy something from one place and immediately sell it to another place for more than you bought it for. True arbitrage is difficult but your daily briefing email can help make things simpler. This section of the briefing shows cards that you can buy from one store and then (in theory) sell to the buylist of another. High profit items are highlighted in red. ProTraders have access to several different daily briefings as well as weekly ones. Once you become a ProTrader you can choose to receive only the ones that interest you, or every single one of them. As a ProTrader, you will have access to "in stock" inventory data from major stores, including historical data. To view it, sign up for ProTrader then go to any card page and click the "# In Stock" button. Perhaps the most powerful tool we've released to date, the Best Deals tool lets you instantly find every card on sale by a vendor that is below the buylist price at another store. Perfect for scouting eBay for bargains or using up your store credit. Simply choose a store from the drop-down menu to start searching. Choose a second store and you'll get a list of cards that the second store is buying that are being sold by the first store below buylist price! The MoneyBoard shows all of the information we have on a specific set on one page. It's your at-a-glance guide to what is happening with a particular set. All columns are sortable - just click the heading. 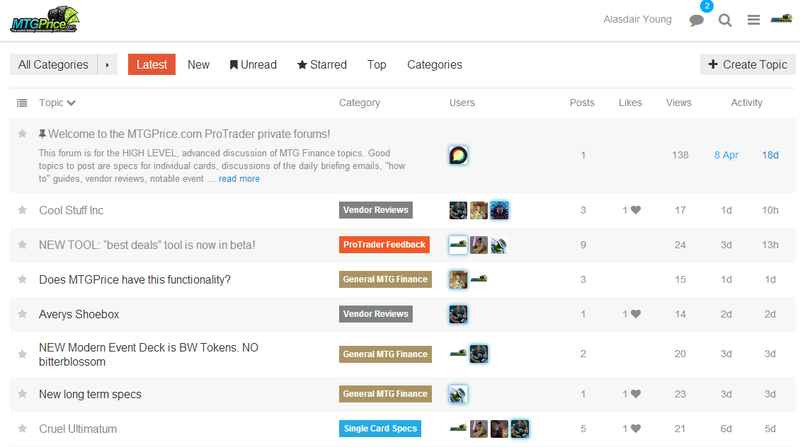 The ProTrader private forums are your exclusive place to discuss the finer points of MTG finance. The private forums are moderated to eliminate spam and to keep things focused on ONLY advanced MTG finance topics. Previous Close Make me a ProTrader!